"It turns out that load funds consistently underperform no-load funds, even when you back out fees." Loaded funds are mutual funds that have a commission to buy them up front. So you have to pay a percent of the investment to the broker just to get into the fund. Because there is such a commission they are start with a negative return that you have to dig out from. Its no surprise then that loaded funds would have a disadvantage versus the no-load funds without a commission charge. But what is interesting is that Motley Fool is reporting that research shows that the loaded funds underperform no-load funds even when you take out the impact of the load fee. So in short.. Stay away from loaded funds. Recently I spent a week in Hawaii on the big island with my new wife on our honeymoon. We had a great time. Somewhat surprisingly one of the things that really helped make the trip more enjoyable was my TomTom GPS navigation unit. I bought a basic TomTom One unit around Thanksgiving last year on sale for $150. We used it a lot in Hawaii to get around and it really made things easier for us. We didn't have to worry about getting lost, it was easy to find places and we saved lots of time and money. I'd recommend getting a cheap portable GPS navigation unit like mine. Ours is pretty basic but it has full street maps of the US, plus there are tons of restaurants, gas stations and other points of interest all ready in it and it works just fine. Bestbuy has around a dozen portable GPS navigation models on sale right now for under $200. Amazon carries a lot of GPS navigation units too. Newegg.com has a variety of GPS navigators as well with some as low as $90. I've been quite happy with the TomTom. Amazon also has the TomTom ONE for $150 right now. There are some variations on the TomTom models. I'd assume they're pretty similar but you should compare to make sure. If you do look for a unit then I'd recommend making sure you have one with extensive built in maps, the ability to update the maps, voice prompting (to keep your eyes on the road) and built in POIs (point of interest). I think its easy to see that a GPS navigation unit saves you time. With one you spend less time looking up places with maps or calling around for directions. Plus it can save you time you might waste if you take a wrong turn or otherwise get lost. A GPS navigator can also save you some money. Using an indirect route or getting lost will end up costing you extra gas. I remember once getting lost going to a relatives lake cabin and I literally spend over an hour driving around in circles trying to find it. I must have wasted several gallons of gas. While that's not a typical situation, I'm certain my GPS is saving me small amounts of gas here and there when I'm in unfamiliar areas. Another way GPS can save you money is by making you aware of cheaper options for food, lodging, gas or the like. For example if you're on vacation and in a hotel with an expensive restaurant then you may end up spending more money there, but if you have a GPS with a list of nearby restaurants then this opens up your options to look for more practical, less expensive dining. A portable GPS navigator has the extra benefit that you can take it along with you. We easily toted ours along on vacation and used it in the rental car. With two cars my wife and I can share the one unit and use it in either car as needed. Overall the convenience and time savings with a GPS navigator are its main benefit. I'd recommend getting a GPS unit for the convenience alone. But it can also save you some cash as well in unwasted gas costs. For us it really did make our vacation more enjoyable. Return of premium term life insurance - Is it a good deal? Return of Premium term life insurance is a form of term life insurance that promises to pay you back the premiums at the end of the term. This sounds almost too good to be true as if you're getting the insurance for free. Say you sign up for a 20 year return of premium term policy and pay $50 a month for the policy the whole 20 years. Then at the end of 20 years (assuming you didn't die) you'd be paid the $50 x 12 months x 20 years = $12,000. Like most things that seem too good to be true there is often a catch. In this case the catch is basically just that return of premium policies have a higher fee than a standard term policy and while you're paying the insurance company premiums for years they are making interest on your money. Standard term insurance: You pay $32 a month and get term insurance for 20 years. You take another $40 and put it in the bank at 6% interest. At the end of 20 years you would have $17,657 in the bank. If you can make 6% or better on your investment then you would come out ahead with the standard term policy. Plus you would also have ready access to your money. It appears to me that a return of premium term life insurance is not a good idea. Generally if something seems to good to be true then it probably is. Term versus permanent life insurance : Which is best? First of all what are term life and permanent life? Simply speaking term life insurance is insurance that covers a set period of time between typically 1 and 30 years. Permanent life insurance is structured to cover your entire life. A big difference between the two is that permanent life insurance such as whole life or universal life have a cash investment mechanism by which you save money into an account via your insurance. Term life insurance is just insurance and has no investment system. Here is a Matrix comparing the insurance options. Smartmoney compares Term or Whole life? and they say : "FOR MOST PEOPLE, the right type of life insurance can be summed up in a single word: term"
MSN Money has an article "The Debate over Term versus Permanent Life Insurance" and they say: " If the answer is less than 10 years, term is clearly the solution.If it is more than 20 years, permanent life is probably the way to go." Suze Orman discusses life insurance at "Don't Let the Kind of Life Insurance You Buy Kill You" and says: "In my opinion, level term insurance is usually the best way to go for the vast majority of people." Dave Ramsey talks about "The Truth about Life Insurance" and he concludes with: "Don't do cash value insurance! Buy term and invest the difference." So Smartmoney, Suze and Ramsey all say that term insurance is the better option. MSN Money says it matters on how long you have the policy. I'm going to agree with Smartmoney, Suze & Ramsey on this one. Personally I believe that term insurance is your best option in general. Permanent insurance only provides a savings account in addition to the insurance coverage and the returns are hard to figure and generally beaten by standard retirement investments in mutual funds. You should try to get enough life insurance to provide for your spouse and dependents financial needs if you are gone. You don't want them to be lacking financially but you also don't want to over spend on insurance coverage that isn't really needed. So how do you figure how much insurance you'll need? Start by looking at your annual income and your debts and assets and consider any one time expenses that you expect. This assumes that 70% of your current income would suffice to meet the needs of your surviving spouse and dependents. You can make a more elaborate formula by considering other income streams and possible expenses. edit : updated 4/4/13 to fix links. If you watch Suze Orman at all you may have heard her recommend that people have a Living Trust. I'm not familiar with a Living Trust other than from hearing Suze talk about it. Suze says its good to help avoid probate. So what exactly is a living Trust and whats probate for that matter? Living Trusts are a legal entity to put your assets in a trust while you are alive. It acts like a will does to handle transfer of your assets after your death. You put your assets into the trust but retain control of them as the trust owner. Living Trusts avoid probate and also can be used to manage your assets if you are incapacitated. Probate is the legal process by which an estate is legally settled. After someone passes away their estate goes into probate. The probate process includes: filing the will with the state, inventorying assets, setting debts of the estate, paying court costs and attorney fees and then finally paying out estate to the heirs. Probate generally requires the help of a lawyer so it can be costly. Generally you only put large assets such as real estate into a living trust. A Living Trust does NOT replace a will. You still need a will to assign guardianship to children and handle personal property and other assets. I found this article at NOLO : Why You May Not Need a Living Trust. Basically in summary they say that if you are young (under 55), don't have large assets and married then you are less likely to really need a Living Trust. Contrary to Suze, Dave Ramsey says that a legal trust isn't necessary He says living trusts are costly, cumbersome and really only useful for wealthy people and he concludes "..a will is really all you need." There are other ways to avoid probate. Joint tenancy for real estate will automatically transfer ownership to remaining owners on deed and Pay on death accounts for bank accounts will name a beneficiary for the account. Personally given the situation of my wife and I, I think we can do fine without a living trust. We can avoid most hassle with probate simply by putting our property in both our names and naming beneficiaries for our accounts. You may know that you can get a tax credit from the IRS if you buy a new hybrid vehicle. But you might not know that the credits available are limited per make of vehicle. When the allotted credits are used then further purchases will not be eligible for a credit. To check if a hybrid is still eligible for a credit and what the amount is, Fueleconomy.gov site has a table of current tax credits for hybrid vehicles. Toyota vehicles : no longer eligible for credits. Honda : are only getting partial credits and are close to having the credits phased out. Ford, GM and Nissan : all still eligible for full credits. Remember you can only get the tax credit if you buy a NEW vehicle. Buying a new car of course is usually more expensive then buying a 1-2 year old used car. However, the tax credit might make it more worth while to look at the new car since it compensates for the difference. This is a review of the book "Small Business for Dummies" by Eric Tyson and Jim Schell. I have the 2nd edition from 2003. I personally like the "Dummies" series of books. They provide no nonsense guides for a variety of topics and put it into terms that everyone can understand. They generally provide good comprehensive overviews of topics. Some might be a little put off by the "Dummies" title since it implies the reader is a dummy, but lets not take it personal. 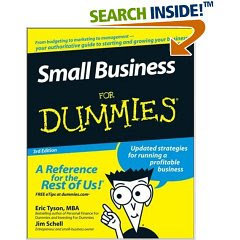 "Small Business for Dummies" covers all the basics of starting and running a small business. It starts with first by asking if running a business is for you and even gives a quiz to test yourself for "Small Business Owners Aptitude". Then it delves into finances about business with topics like covering your own health insurance and retirement and making sure you have personal assets to support yourself while you're in startup. Financing, organization (corporations and LLC), Buying a business, franchises, evaluating and negotiating to buy business. The next major section of the book is on running a business. It focuses on operations including hiring employees, accounting, leasing property, marketing, dealing with customers, handling cash flow, managing inventory. The last major section of the book discusses keeping the business successful and afloat. They talk about hiring good employees and keeping them running, dealing with legal issues and obeying laws and regulations and then there's a chapter focused on tax issues. The information in "Small Business for Dummies" is a good start if you are thinking of starting a business of your own. I'd recommend taking a look if you're interested in starting a business. Look for a copy in your local library. I've recently gotten married. Yay! Now that we're married there is a bit of paper work to do to update names and such. Add spouse to health insurance at work - This is the #1 priority since we want to get her on my coverage as soon as possible. Shop around for car insurance policy - We'll combine our policy so that means canceling one or the other. Would also be a good time to shop around for good rates. Set up a joint bank account - We will have joint finances. So we'll get a joint account. It may also be a good time to switch banks for me. Get a Will - I know I should have one already but I don't. As a single person I wasn't that concerned. But now it is more important. Investigate additional life insurance - I get 2x my salary coverage from my employer. We'll probably want to add some to that. It costs 2¢ to idle your car for a minute. Your exact cost will vary and depend on the efficiency of the car. V8's will use more and 4 cylinders will use less. But lets use that 2¢ as a estimate. Why does 2¢ a minute matter? Of course if you sit idling your car for an hour at a time that will cost you $1.20 an hour. But I doubt many of us do that. However we do idle our cars a lot and just don't realize it. Lets say you do the following: You drive to Starbucks and go through the drive through and idle 2 minutes in line. Then you drive to school to drop off the kids and sit in the car for 1 minute while you say good buy. Then you swing by the bank and sit in the drive up lane for 5 minutes while you wait behind 2 other customers. Later in the day you return to pick up the kids at school and you're a few minutes early so you end up waiting 5 minutes there. That seems pretty typical right? It adds up to 13 minutes in that day for a cost of $0.26. If you did this same kind of thing every weekday then you'd be spending an extra $5 a month or $60 a year in excess gas use. To keep from wasting money while idling your car consider going inside a place of business (fast food, bank) instead of using the drive up. If you know you'll be waiting for more than a minute then turn the car off. You might have heard that it costs more gas to restart the car than to idle it. Well this simply isn't true for anything but the shortest periods. Edmonds tested it and found that you save gas by turning off your car for anything over a minute. Today I'll compare credit cards that give you cash back for purchases. If I recall right the first card to do this was Discover with their 1% back on purchases. Nowadays it seems every major credit card issuer has a card with 1% rewards or better. CreditCardFlyers site compares cards here. Its a nice site with a calculator that will estimate your rewards for each card type. But I should note I ran into a couple details where the site was out of date or where the calculator made a math error. So I'd double check everything there with the credit card vendor sites themselves. So I could potentially spend $7500 and get a $150 plane ticket. That would be a 2% return. On average though you're going to hit the midpoint of expenses so rather than maximizing the reward with a $350 ticket you're more likely to spend something midway between $150 and $350 or about $250. So that would be like spending $17500 and getting 35,000 miles to cash in for a $250 ticket. This equates to a 1.4% return. If you're looking at more expensive tickets then the rate is 100 x the ticket price in rewards. So if I spend $700 on a ticket it would cost 70,000 rewards and I'd have to spend $35,000 on the card to hit that. That would get you a 2% return but you'd have to spend a lot to hit that level. The Discover Open Road card offers 5% on gas and auto maintenance for the first $1200. Plus they give "up to 1%" on other purchases. If you're unfamiliar with Discover the "up to" is an important detail. What they do is give 0.25% for the first $1,500, 0.50% on the next $1,500 and then you only hit the 1% level for purchases over $3,000. There are several cashback credit card options at Citibank. Their Dividend cards normally give 2% back on supermarkets, drugstores, gas stations & utilities and 1% on all other purchases. Plus they have promotional deals which vary per card where you can get 3-5% back on supermarkets, drug, gas & utility for the first 6-12 months. They limit you to $300 rewards a year. The popular Chase Freedom card gives you 3% back on the purchases in the top 3 categories that you spend the most in each month plus 1% on other purchases. But there is a limit of $12 rebate per month for the 3% rate. The BP card from Chase offers 5% on gas at BP gas stations and 2% on restaurant, airfare, car rental and lodging as well as 1% on everything else. There's no limit on the rewards. The Blue Cash card from American Express offers up to 5% back. For the first $6500 you spend you get 0.5% on grocery, drug and gas purchases and 1% on other items, then after $6500 you get 5% on grocery, drug and gas and 1.5% on everything else. There is no limit on the cash back. This one is only a good idea if you spend over $6500 a year on your credit card. If you are a Costco member then there is also the True Earnings card from Amex and Costco. This card is a combination of Costco membership and Amex card. The rewards are 3% on gas, 3% on restaurants, 2% on travel and 1% on everything else. Again its unlimited rewards. Personally I think that the quality of service from the bank is also a very important aspect to consider. J.D. Power has ratings of customer satisfaction for major credit card companies. American Express and Discover had very high ratings. Chase, Citibank, Wamu, US Bank and Wells Fargo came in average. Bank of America, Capital One and HSBC were rated below average. I use credit cards for all the purchases I can in order to take advantage of the cash back rebates. But I pay off the balance every month. Before I discuss the topic of credit card rewards, I want to make this clear: It is only worth looking at credit card rebates if you pay off the balance of the credit card every month. If you carry a balance on your card then you should instead be focusing on reducing your credit card debt first and avoid additional credit card use. Right now I'm using a Citibank dividend platinum card that gives me 1% cash back on most purchases and 2% on gas, grocery, drug store, convenience store, cable and utility purchases. Its a pretty decent reward and I like Citibank as a company overall. One drawback is their maximum reward is $300 a year and I'm going to exceed that this year primarily due to a large one time only expenditure that I put on the card. So I'm looking around for other options. I've seen some other options for cards that I'm looking into. There are 3 main categories of rewards cards: cash rewards, miles rewards and points rewards. Cash rewards are fairly self explanatory they give you cash rebate on your purchases, usually 1% or more. Miles rewards are tied to airlines miles points and they give you airline miles for your credit card purchases, usually 1 mile per $1 spent. The Points rewards fall into other promotional points programs like hotel frequent stay programs or simple points for items rewards programs. Generally I'd say that the cash rewards are the most flexible and easiest to use. You typically just get a cash rebate on your purchases. You're not forced to use the reward on anything in particular and aren't forced to work under someone else's rules or schedules. With miles or points systems you might be able to get a higher return on your rewards but you are required to use the service that the card is attached to. To determine if a miles or points system might be more beneficial for you look at the program details and determine if you will be able to get good use out of the rewards offered. Would you be able to use the miles? (yes or no) People often assume that they'd be able to make use of frequent flier miles, but with the restrictions and blackout dates on some programs it can be hard to ever use your miles. So the first step in deciding if an airline miles card is a good choice for you, you should make sure you'd be able to use the rewards. To do this, consider what places you go and when and what airlines typically fly those routes. For example if you are considering a miles card tied to a specific airline, check the airlines website and see if you'd be able to redeem their frequent flier miles for a trip to a location you would go at a day/ time that you'd travel. For example if you fly from Texas to Illinois every Christmas to be with your family on United airlines then check the United website to see if you'd be able to redeem their frequent flier miles for a Christmas trip. If the answer to whether or not you can make good use of the miles is yes then go on to figure the rate of rewards. Of course if you can't use the miles then theres not much sense in getting such a card. What is the effective dollar value of the rewards? If you redeem frequent flier miles then you're saving the cost of a ticket. The ticket prices vary but you can estimate general costs. To do this I'd simply do a search on a site like Kayak.com or Orbitz.com and see what typical round trip fares will run you. You can also check Farecast.com which has data on price trends over time. For the example above a Christmas time trip from Austin Texas to Chicago Illinois ran $402 a seat if purchased well in advance. You can then use this as a ballpark figure. What is the % return of the travel rewards from credit card purchases? To determine this figure the cost of the ticket you're saving divided by the total credit card purchases you'd have to make in order to obtain the miles for it. For example if you get 1 mile per $1 and your round trip ticket from Austin to Chicago costs 25,000 miles then it would take $25000 of credit card purchases to get that reward. The value of the reward is $402 so you are getting $402 reward / $25000 purchases which equates to a 1.6% effective return rate. (If the card has no fee then skip this. ) If theres an annual fee, then figure what is your annual % return rate less the fee? With airline miles cards it is not uncommon for them to have an annual fee. To determine your annual rewards rate consider your annual rate on return less the fee. Starting with the rate we just figured above multiply that % rate by your annual expected credit card purchases then subtract the annual fee. So for example if you spend $12000 a year on your card and we figured the 1.26% rate then your annual return is $192 but if there is an annual fee of $65 then our total annual return less fee is $192 - $65 or $127. Note that this is marginally more than the $120 we would earn in cash with a straight 1% cash return card. Make the decision is it really worth it or not to go with miles? Now that you know how much the card will return you in equivalent cash value you have to decide if its really worth it to have your rewards in the form of airline miles or if cash would be better. If you frequently travel and miles are easy enough to use then a higher return on the miles can make it really worth your while. But if the effective return from miles less a fee for the card isn't that much more than just getting a cash return then airlines miles are probably not the best choice. For the example above I figured the effective rate at $127 a year for airline miles card based on a specific usage but this is just $7 a year more than a flat 1% cash return for the same amount of credit card purchases. In my opinion that $7 more return is not worth the loss of flexibility that you'd get with cash so I'd stick with the straight cash back refund option in that example situation. Can you use the service? yes or no. How much credit card purchases would you need to spend to get the service? Divide the value of the service by the required purchases to find the reward % rate. Lastly, find you real annual return by subtracting any credit card fees. To evaluate points rewards system you can do a similar calculation. Simply figure out if the % return rate is in terms of value of the item or services that you can obtain with the rewards per dollar spent on the credit card. So the same methodology can be used for Hilton hotel nights or free Sony electronics. Previously I discussed the myth that we buy "everything" from China and this is a related myth. People believe that we are amassing a giant debt to China. In actuality only a small % of our public debt is owed to China. According to the current Federal Debt summary bulletin, the total Federal Debt is $9.4 Trillion. $4.1 Trillion is owed to the government. $5.3 Trillion is owed to the public. Of the public debt most of it is owed to US citizens. According to the US Treasury which publishes list of Foreign holders of US Treasuries, China currently owns $490 Billion in US Treasuries. Japan owns more of our debt than China with over $600B. Overall Foreign holdings of US Treasuries total over $2.5 Trillion. Reality: China only owns about 5% of our outstanding federal debt. Most of the US debt is owed to the government itself and US residents. With cell phone systems nowadays you're usually paying $30 or 40 a month minimum. If you don't use your service that much then you might be able to save some money by switching to a pre-paid cell phone plan. Generally the prepaid plans charge you $0.10 to $0.25 cents per minute Some plans have no regular monthly charge and some have a $1 daily fee or a monthly access fee. Generally it looks to me as if T-mobile & AT&T have the better plans overall. T-mobile's per minute costs are pretty reasonable when paying by the minute. AT&T has a cheap phone cost if you're using a $1/day plan. If you use 10-30 minutes per month then the $10 cards from T-mobile would probably be your best deal. You could spend $10 for 3 months and have 10 minutes a month to use. If you only use your phone in the evening then one of the $1/day plans from T-mobile or AT&T would probably work very well. For example if you make evening calls 2 days a week then you would pay $8 / month roughly. But if you make much of any daytime calls then these plans don't work well. Daytime minutes are $0.10 each which can add up quick. If you're using 250 or more daytime minutes then you'll come out ahead with a cheap monthly plan. However, if you call infrequently and/or call in evenings only then a prepaid plan could end up saving you some money. 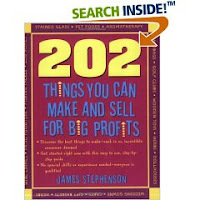 This is a review of the book 202 Things You can Make and Sell for Big Profits by James Stephenson I have the 2005 edition of the book. This book is pretty straight forward and primarily gives a list of 202 things that you can make and sell. Its generally aimed at home or small start up businesses and people looking for a good side business. But the information could be used to start a full time business too. The first 100 pages or so of the book are general information on starting a business. It covers legal and financial basics, setting up shop, dealing with inventory and going online. Its overview level information on starting a business. The meat of the book is the remaining 200+ pages which are the list of 202 things to make and sell. The list of items has a wide variety of things with varying skill levels and start up costs. Each entry lists the skill level, start up cost and some references for further information. There is roughly a page for each idea. The ideas range from building large items to making and selling snack food. Examples are garden sheds, party-in-a box, canoe paddles, pinatas, snow cones, soap and utility trailers. A few items I thought were particularly interesting are little league cards (like baseball trading cards), personalized children books and greeting cards. There are enough ideas in 202 Things You can Make and Sell for Big Profits that its likely you'll be able to find 1 or 2 items that would work for you. Because the book is primarily a list of 202 items you will probably skim through it and skip many items pretty quickly. I'd recommend 202 Things You can Make and Sell for Big Profits if you are looking to start a business primarily focused on making something. Its good for ideas. Look for it in your local library. Shred your financial documents before you throw them out. - If you shred your documents then nobody can dig through the trash and find information on your identity that they might use to commit identity theft. Guard your social security number and don't give it out unless absolutely necessary. - The social security number is used in many financial systems and is a key in determining identity. The more you give out your SSN then the higher the odds are for an ID theft. Check your credit report. - You can get an free copy of your credit report annually. Take advantage of this to check your credit every year and make sure there isn't' anything fishy going on. Sometimes ID theft can go unnoticed and a credit report is a good way to verify nothing is wrong. Review your credit card and bank statements as soon as possible after receiving them. - Every month check your statements. If you don't check your statements carefully and just auto pay then you may miss fraudulent activity charged to your accounts. Use good passwords. - For your computer systems an easily cracked password could be like an unlocked door for an ID theft. Use a password with a combination of letters, numbers and special characters (!#$&*). The FTC site on Identity Theft has tips on deterring ID Theft. The government National Crime Justice Reference Service has a report on the facts and figures of the prevalence and impact of identity theft. "In 2004, 3.6 million households, representing 3% of the households in the United States, discovered that at least one member of the household had been the victim of identity theft during the previous six months"
"About two-thirds of households experiencing identity theft reported some type of a monetary loss as a result of theft. The average loss was $1,290." "About 1 in 6 victimized households had to pay higher interest rates as the result of identity theft, and 1 in 9 households were denied phone or utility service. Households were equally likely to be turned down for insurance or pay higher rates, be the subject of a civil suit or judgment, or be the subject of a criminal investigation (7%, 5%, and 4%, respectively)." Identity theft is common enough to be concerned with, can cost hundreds or thousands of dollars and can have side effects on your credit ratings and interest rates. The other day I pointed out how a pack of standard playing cards is a great frugal form of entertainment. In general board and card games can be a great value. Below are several games I've enjoyed that sell for under $10. I'm sure you can find a basic game of checkers or chess in your local toy or department store for under $10. Yahtzee $6.69 in stores at Target. - A dice game where you attempt to roll dice for combinations and score the most points. Chinese Checkers $8.60 at Amazon - Move your marbles across the board. I looked at Amazon, Target and Walmart and linked to the cheapest where more than one of them sold it. But you could also comparison shop yourself online and at your local stores. Back in April I posted about how I was Spending a lot on eating out. Since then I've tried to cut the spending. I started bagging a lunch instead of eating out for lunch at work. I've also been using Restaurant.com gift certificates I bought for $4 each to get $25 off of certain dinners. From April to June I've cut my eating out expenses 20.8%. That trend is definitely good for the pocket book. I still do spend a LOT on eating out but I do so knowingly. Eating out is one of my big pleasures in life. I'll continue to monitor my eating out expenses and look for any ways to keep the costs down while still enjoying myself by eating out frequently. I wouldn't be eating out much if at all if I had outstanding credit card debts or wasn't saving a hefty portion of my income. But since my finances are in order I choose to spend money on eating out even though its an unnecessary expense compared to eating meals at home. You probably already have a pack of playing cards. If you don't then you can buy a pack for around $1 pretty easily at most department stores. There are countless card games you can play for hours upon hours of entertainment. Bridge is an elaborate game for 4 players. Poker has grown in popularity in the past 10 years and has always been one of my favorites. With Solitaire games you can play alone. Solitaire Central has rules for 1500 varieties of Solitaire. I've been a loyal Netflix user since 2003. I enjoy their service and find it to be very convenient and pretty cost effective. Lately however I've been pretty busy and I haven't been watching my Netflix DVDs very regularly. So I decided to go look at my Netflix account history and see exactly how many movies I've been watching. From late 2003 till mid 2008 I've rented 329 movies from Netflix for an average of 6.2 movies a month. With a monthly fee of $17 that comes out to $2.73 per movie average cost for the total history. That's not bad versus typical $4 movie rentals but I might do better with RedBox rentals that are only $1 /night. I've had ups and downs in my rental activity at Netflix over the years. In 2005 I was most active and had 115 movies or 9.5 per month for an average cost of $1.77 per title. Lately though my activity has slowed. In the first 5 months of 2008 I have been fairly inactive. I've only had 8 titles out so far and at $17 a month I'm averaging over $10 per title so far in 2008! Ouch! I've also used some watch on demand with Netflix so that raises my average up to more like 10 titles equivalent so my average per title is more like $8.5 so far in 2008. Still not very good considering I can drive to Blockbuster and pay half that easily. However its only been a few months and I've had some dips of activity in previous years too. In the past 30 days I've watched 5 titles so I maybe back on track to more regular usage moving forward. But still its worth considering cutting the Netflix plan down to a lower rate option. Right now I'm on the 3 at a time plan for $16.99. Given my recent usage level I could probably drop down to the 1 at a time plan. Even looking at my long term history I could probably work just fine with the 2 at a time plan. I could abandon Netflix entirely to just go to regular rentals at a local Blockbuster or RedBox outlet. But one big benefit of Netflix is that you can get a lot of obscure titles. I skimmed through my history and found that about 40-50% of the DVDs I watched are more obscure titles that I don't think you can find in a typical Blockbuster or REdbox. The remaining 50-60% of the movies are mainstream titles that are probably going to be available in most video rental locations. Netflix also has a titles that you can watch on demand over the Internet. This is a relatively new feature of Netflix and I've used it a bit in the past year. In the past 12 months I've watched 53 titles which includes individual TV episodes. I figure this equates to roughly 1 extra DVD worth of entertainment per month. The convenience level of Netflix is also a great bonus. You can save time and gas money with Netflix. I don't have to drive down to the video store and go through check outs. I can just browse the Netflix site once in a while and load up my list of movies then they come to me automatically. If you're not driving to the store then you're also going to save on gas. If I were to make weekly trips to the Blockbuster near me then that would be about $3-4 in gas costs monthly. For this reason I am not ready to quit Netflix entirely. But I could cut back my Netflix plan and possibly partially replace it with Redbox rentals. So given my normal usage of Netflix whats my best choice? Normally my usage with Netflix is 6.2 films a month with 50% obscure titles. So that's 3.1 obscure and 3.1 mainstream titles on average. Option 1: I could get that with the 1-at a time unlimited Netflix plan for $9 a month plus supplement it with 2-3 rentals at Redbox for $3. So combined that would give me 1-at a time Netflix for $9 plus 3 Redbox rentals at $3 for total of $12 a month cost. That should give me enough movies for what I've watched historically and it would be $5 less. However it would be less convenient to have to make trips to Redbox. Option 2: I could just drop down to 2-at-a time option on Netflix. This would give me plenty to hit that 6 films a month average and cost $3 less a month. I also wouldn't have to bother going to REdbox. I'm going to go ahead and try out Option 2 and drop from the 3-at-a time plan to 2-at-a time.and see how that works. I'll test it for a month or so and if it works out all right then I'll stick to it. Could you benefit from this kind of analysis? Maybe. Consider at least looking at your DVD rentals over a few months and see how much you rent. If you're using Netflix now then look through your account history and see how many movies you actually use. You might be surprised how little you use it and what the actual cost per DVD is. If you rent a lot of DVDs (especially more obscure titles) then it might be worth looking into using Netflix. This is a review of the book The Insider's Guide to Buying a New or Used Car by Burke Leon and Stehanie Leon. I have the 2nd edition from 1997. The book is now in its 3rd edition. The book is a complete guide to buying either a used or new car. They discuss topics such as : researching cars, getting loans, doing a trade in, test drives, figuring dealer costs, buying tactics, countering the dealers sales pitch, and good and bad negotiating tactics. There are two major sections of the book the first is on new cards and the second is for used cars. 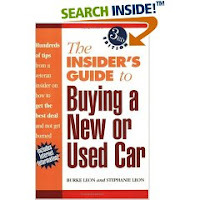 There are a lot of things I like about The Insider's Guide to Buying a New or Used Car. Its a thorough guide to car buying for a car buyer. There are a lot of good tips on negotiating sales and I think that's the section I got the most out of. Americans do not haggle for many purchases so negotiating for price isn't something many of us are as experienced at. The book has other tips on getting a good deal like 'how to dress' and there's a chapter specific to 'special concerns of women'. There is also an appendix with several car buying checklists. The author has been a car dealer for years so they know the industry. On the down side I didn't like that the authors seemed pretty open and friendly to using a lease to purchase a new car. I'd never look at a lease and I think its a very poor financial choice. I also prefer buying used cars and the book focused more on new cars. I would recommend reading The Insider's Guide to Buying a New or Used Car if you are considering buying a car and are new to the process or looking for some tips. Look for it at your local library or thrift stores. Lets say you are comparing 3 cars a 2005 Honda Civic EX, 2005 Ford Focus ZX5 SES and 2005 Hyundai Elantra GT sedan. The Civic is going for $14,168, the Focus is $9,645 and the Hyundai is $9,497. For the sake of example, lets pretend you consider these 3 cars to be equivalent other than sticker price. Which should you buy? It seems the Hyundai is the best option since its less than the other two and the Honda looks like the worst buy by far. Not so fast. If you look at the Total Cost of Ownership (TCO) then the Honda is $29,978, the Ford is $29,450 and the Hyundai is $30,860. The difference in purchase price and TCO is most striking between the Honda and the Hyundai. The Hyundai costs over $4k less than the Honda but overall the Honda will be cheaper to own over the years. The Ford focus has both a low purchase price and a lower TCO overall so its financially the best buy in this example. Depreciation: Cars depreciate at different rates. Brands with better demand in the market keep their value better. Fuel Costs: This one is fairly straight forward. Cars with worse MPG end up costing more to use. Insurance: Cars will have different insurance rates. A luxury sports car with a high powered engine will cost a lot to insure compared to a modest family sedan. Repairs and Maintenance: Different reliability levels, different labor costs and different parts prices can all add up to variations in repair and maintenance costs. Each of these can vary from model to model. The depreciation on the Honda is $6047 or about 43% of its value and the Hyundai depreciates $4756 for about 50% of its value. Fuel costs $8498 for the Civic and $9537 for the Hyundai for a $1,039 difference. Maintenance and repairs are $7,509 for the Hyundai and $5,337 for the Honda for a $1,709 difference. These differences all add up. The Honda retains more of its value, costs less for fuel and is cheaper to repair and maintain than the Hyundai. So when looking at buying a car make sure to research the TCO and not just rely on sticker prices to determine cost. You can find TCO data for used cars by going to Edmunds Used Car website and then drilling down to the specific cars you are interested in. Consumer Reports has a list of 16 fuel efficient used cars. To see the full list go to the Consumer Reports article. They have several cars under $10k and several for $10k to 20k. 1998 to 2002 Chevrolet Prizm gets 32 MPG and it starts at $2614 on Edmunds for the 1998. Its noteworthy that the Prizm is basically a rebranded Toyota Corolla. 2000 Honda Insight gets 51MPG and Edmunds lists resale at $7602. Keep in mind this is just a 2 seater. 2006 Mini Cooper base hatchback with 30MPG listed at $14,311 on Edmunds. My favorites are the Chevy Prizm if you're strapped for cash or the much newer Honda Civic Hybrid if you can afford it. I found this article on MSN : The Myth of the Marriage Penalty. It discusses whether there is really a tax penalty for married couples over single filers. Check out the article it makes some interesting points. Basically it seems that with current tax law at least that there really isn't a penalty in general with some rare exceptions. But even before tax changes in 2001 the majority of people didn't have a penalty. I was curious to check the numbers so I decided to compare taxes for a couple situations. I looked at combining equal incomes of $40k and combining disparate incomes of $100k and $40k. Lets compare two people who make $40k each. If single you would get a deduction of $5,350 and an exemption of $3,400 for a taxable income of $31,250. The tax bill on that for a single person was $4,293. So two people filing single would pay $8,586 on $80,000 combined income. If those same two people got married and still made combined $80k then their taxable income would be doubled at $62,500. If married filing jointly the tax on that would be $8,589. So in this case the income tax is virtually the same between single or married. If there are two people with one making $40k and the other making $100k then their tax filing single would be $4,293 and $19,654 respectively. If those two people get married and file jointly with a combined income of $140k then the tax bill is $23,473. In this case the tax bill is $23,947 separately and $23,473 joint. So in both cases there is no penalty. These are only a couple examples and they only use very plain tax circumstances with no itemization or anything but plain standard deduction. I'm sure other situations would differ. "To put this in perspective, the difference between a Focus and an F-250 over five years is $60,000. The annual pretax income of a typical family in this country is also about $60,000. So choosing a F-250 over a Focus is like volunteering for a 20 percent pay cut." But whether the difference is $30k or 60k the point remains the same. Buying a big expensive car or truck will cost you a lot in the long run and the extra cost is probably a significant portion of your income. Black Angus steak house is currently running a promotion for graduates. If you go as a group/family and buy 3 meals then the graduate will get a free entrée. Its limited to $19-23 depending on location and expires June 30th. Below are a big pile of articles on saving gas from FreeMoneyFinance. With gas running over $4 a gallon nowadays any little bit of savings can go a long way. If you're a typical driver with a 20mpg car that drives 12,000 miles a year, just 10% savings in gas usage can save you over $200 a year. FMF is a great personal finance blog with tons of resources. If you haven't seen it before I highly recommend giving it a read. This is a review of The Unofficial Guide to Real Estate Investing. The book is now in its 2nd edition. I have the 1st edition so my review is based on that version. The Unofficial Guide to Real Estate Investing is a very comprehensive introduction to investing in real estate. The book covers everything from valuing properties, buying and financing, tax implications and 1031 exchanges all the way through being a landlord. The basic topics covered are : investment concepts, figuring returns, valuing property, financing investment, different categories of real estate, creating your own investment plan, planning for taxes, purchasing the property and managing tenants and expenses. One topic they cover that I especially like is creating an investment plan for yourself. They go through how you can figure your returns and structure your investments in a way to mean your planned % rate of return. They discuss various types of financing for real estate. I the only major criticism I have of the book is that they are not cautionary enough about ARMs, negative amortization loans and loans with very low down payments. As we all know from today's real estate market there is risk in highly leveraged and short term adjustable real estate loans. However, hey do not present real estate investing as a 'get rich quick' scheme. They are just a bit less conservative on loans than I'd like to see. 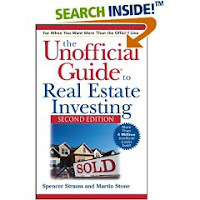 If you are interested in real estate investing then The Unofficial Guide to Real Estate Investing would be a good general guide to get you started. I'd recommend checking at your local library to see if they have a copy. You can also currently get it used via Amazon Marketplace for about $6 including shipping. Its from July 2003 but the tips are just as good now. 1. Pay vet bills of $50 or more by credit card. That gives you federal Fair Credit Billing Act rights to dispute a bill for unsatisfactory service, which you don't otherwise have. 2. Choose a vet before you need one. Ask for price quotes for annual exams plus nonroutine big-ticket items, such as repair of a broken limb, surgery rate per hour, and gastrotomy. 3. Ask for discounts. More than 60 percent of vets cut the cost of annual checkups if you bring three or more pets; nearly half offer a 10 percent discount for senior citizens. 4. Talk to your vet about giving booster shots every three years instead of annually. 5. Check prices for shots and spay/neuter services at a humane society or SPCA, which can be less expensive than a vet. Some also provide free or low-cost services to low-income and senior-citizen pet owners. 6. Keep copies of all itemized bills and health records in one folder so you can easily change vets if necessary. 7. If you must use a higher-priced emergency veterinary hospital after hours, schedule follow-up visits with your regular vet during business hours. 8. Get a second opinion before approving pricey treatments. 9. Research pet disorders and consult a good pet-health-care reference. The detailed Merck Veterinary Manual is free online at www.merckvetmanual.com/mvm/index.jsp. 10. Ask for a written prescription from your vet so you can shop for the best price. 11. Shop for pet drugs at regular pharmacies, which often beat vet prices. But don't dispense drugs from your medicine cabinet without consulting your vet. Ibuprofen can kill a dog; acetaminophen, a cat. 12. Ask your vet to prescribe a generic drug when possible. And buy in bulk drugs that you will be refilling long term. 13. Get a cat. They have fewer serious health problems and genetic diseases than dogs. 14. Exercise your pet, and don't overfeed it. 15. To fight tartar and plaque, buy dry cat or dog food or specially formulated treats. Check teeth for fractures and gums for bleeding. Treat dental disorders so bacteria don't spread and cause bigger problems. 16. Keep pets fenced or leashed when outdoors to prevent them from getting hit by a car. 17. Store drugs and chemicals out of your pet's reach. 18. Ask your vet about giving your pet heartworm drugs. 19. Use a flea and tick product. 20. Choose your breed and breeder carefully to reduce the risk of genetic disorders.